Heat oven to 350°F. Line 24 regular-size muffin cups with paper baking cups. In small bowl, mix flour, cocoa and salt; set aside. In large bowl, beat 1/2 cup butter and granulated sugar with electric mixer on medium speed until mixed. Add eggs; beat 1 to 2 minutes or until light and fluffy. Stir in food color and vanilla. Beat in flour mixture alternately with buttermilk on low speed just until blended. Beat in baking soda and vinegar until well blended. Fill muffin cups 2/3 full. 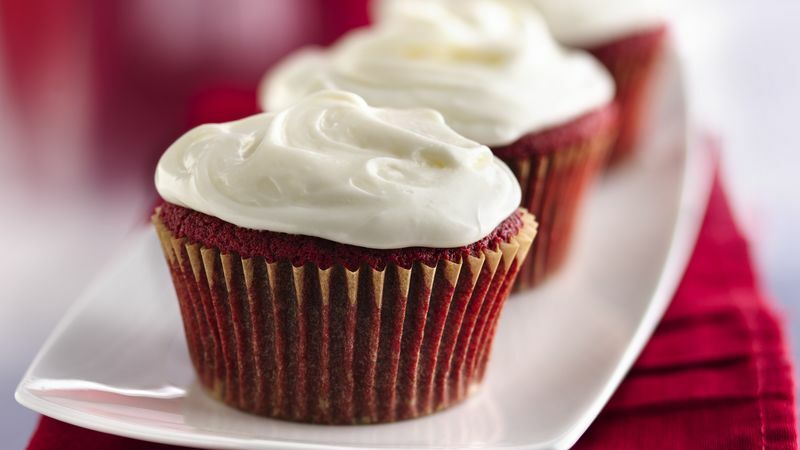 Bake 20 to 22 minutes or until toothpick inserted in center of cupcake comes out clean. Remove from pan to wire racks. Cool completely, about 30 minutes. Remove lid and foil seal from jar of marshmallow creme. Microwave on High 15 to 20 seconds to soften. In large bowl, beat marshmallow creme and 1 cup butter with electric mixer on medium speed until smooth. Beat in powdered sugar until smooth. Spoon 1 heaping tablespoon frosting onto each cupcake, swirling frosting with back of spoon. Add a little holiday cheer to each cupcake with a holly sprig. Make two holly leaves by splitting one green spearmint leaf candy in half horizontally and add 3 red cinnamon candies for berries. Or top frosted cupcakes with a snowy drift of flaked coconut.